Graeme Swann's retirement from cricket has come in the midst of the worst Ashes tour for England I can remember. The reason I say that is that, unlike previous heavy defeats, England arrived here as favourites and are being comprehensively outplayed by a side no better than they are. Australia have simply looked the hungrier side - and the hosts have certainly benefited from their successful targeting of England's senior spin bowler. "There was a moment last week, late in the whacking at the Waca, when you wondered whether something fundamental had changed in Graeme Swann. "It wasn't the sight of him being smacked for six by Shane Watson, but the way he accepted it in such supine fashion that he kept bowling exactly the same ball, into exactly the same obvious spot in Watson's hitting arc, with exactly the same results." Swann's decision to retire midway through the series has brought a lot of criticism - which I can understand. The timing is certainly not ideal, but we don't know what sort of conversations have been had. Coach Andy Flower has been thinking about the direction England go in from here, and the final two Tests will be a part of that. Perhaps Swann has been told: "We're not going to pick you for the final two Tests. If there's anything on your mind, let's talk about it." I would like to think that was the course of the conversation - that he was given the option to go without being dropped. There will also be others in the squad - wicketkeeper Matt Prior, batsman Kevin Pietersen and bowler James Anderson, to name three - who may well be thinking about their own long-term futures. It is often the case that, when one goes, others go. I do understand people lashing out over Swann's decision, but people should not forget the contribution that he has made to English Test cricket. If and when Prior and Anderson go, they will be replaced. 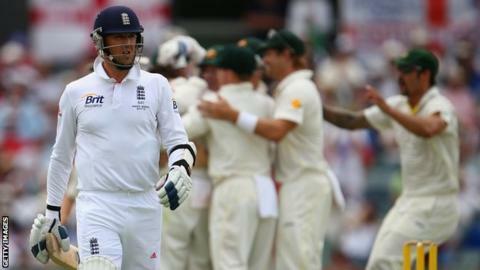 Swann's retirement has posed a bigger question for England to answer. He was a wicket-taker, but he was also a tight defensive bowler. England could chuck him the ball and he would fulfil both roles, which allowed them to go with only four bowlers. His significance to the attack was the reason Australia got after him. Swann was also an outstanding second slip fielder, a bouncing character and - off the field - great fun to interview. He had already given out the signals that this would be his last tour, so he clearly knew he was coming towards the end of his time as a Test player, but he will still be missed on the field. You can't replace him man for man, so a little juggling will be required. Ben Stokes has emerged as somebody who can bat at six or seven, which could balance things up, but England are not blessed with spin bowling options. Monty Panesar is likely to get a chance now, but the Essex left-armer's fielding is risible. Lancashire's Simon Kerrigan was taken to the cleaners in his one Test outing, although he would hope to show he could bounce back from that, while young Scott Borthwick at Durham has got some promise. But there's not a huge amount out there. I suspect England will try to get through the series against Sri Lanka and India with Panesar and then see who comes through. But it's not going to be easy. In the short term, England must try to salvage some pride from a tour that has offered few bright moments. Stokes has shown a way forward to the future, Stuart Broad had bowled well before getting injured, while Joe Root has batted well and showed impressive character in the face of Australian hostility. But that's about it. As a team, they are perfectly capable of winning matches in this series. They need to win a toss, make a big score and ask some questions of Australia. They have to fight tooth and nail to make sure this is not another 5-0 whitewash.